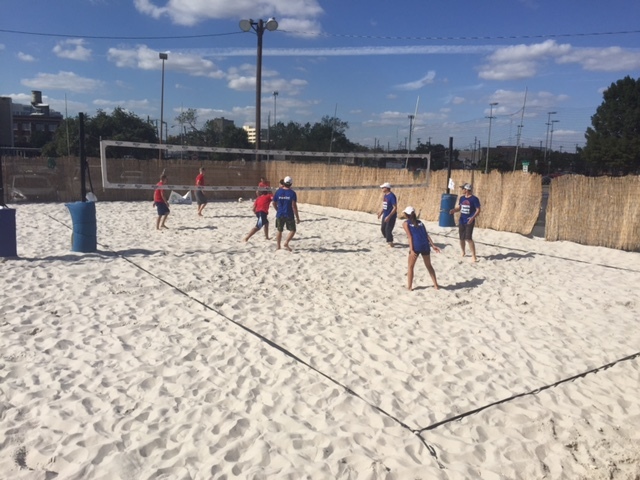 IMA Dallas’ annual Sandblast charity event took place on September 17, 2015 and was a smashing success. Benefitting Junior Achievement of Dallas and the IMA Foundation, we moved our venue this year to the Sandbar Cantina & Grill in Dallas’ Deep Ellum neighborhood. 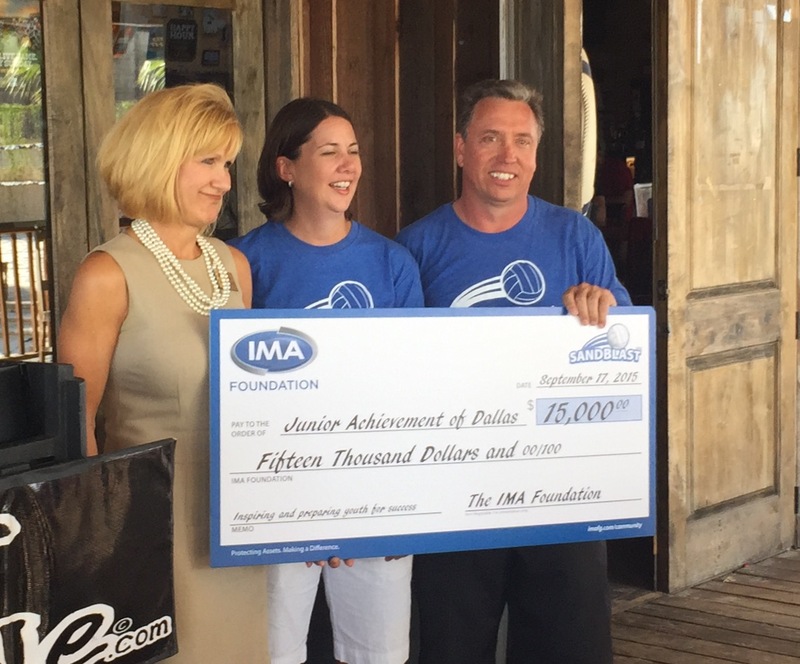 Several of IMA’s business partners and clients participated in the event. I was particularly impressed with the skill and stamina of many of the volleyball teams, as they continued to play hard as the mercury climbed into the mid-90’s yesterday afternoon. Of course, we managed to have lots of fun in the process of raising money for these worthy causes. For me, the personal high point of my day was FINALLY delivering my first-ever photobomb! Indeed, I have attempted to bomb many a portrait as the phenomenon has gained in popularity, but have always managed to be busted prior to the shot. This, however, was perfectly timed as two of my coworkers posed for the camera. We work hard at IMA, and I feel particularly blessed to work with a group of good, fun-loving people. But all joking aside, we raised $15,000 for Junior Achievement, and that is a worthwhile achievement in and of itself. It is indeed a blessing to work for a company that gives so much to the communities in which we live and work. IMA Sandblast is an annual event. If you have interest in joining us next year, give me a shout. It’s lots of fun and supports a very worthwhile cause. 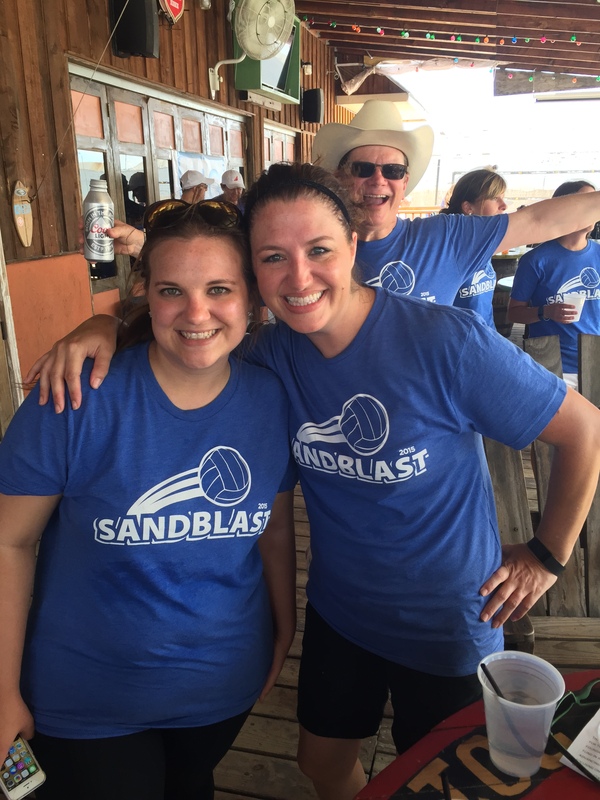 Sandblast 2015 raised $15,000 for Junior Achievement Dallas! Surely you want to talk with this guy! Crap. The name rings a bell but I sure as heck can’t place the company she’s with. I made almost 50 calls this afternoon. And to make matters worse, I’m moving at 70 miles per hour and she is talking very fast, so of course I didn’t catch her name when she first said it. Buying time and hoping she’d say the name of her company I continued. I figured it was best to be succinct in my honesty; perhaps I could salvage this call. Of course, I have replayed this call time and again in my head. I’ve banged my head against the proverbial wall. I gave myself a good cussing out. When I arrived in the office this morning I checked my call list from yesterday afternoon and found Jan Brady. I removed her from my call list – for now. And, first thing this morning, I turned off the automatic call forwarding feature on my office phone. Some day, when Ms. Brady is a client, I’ll relate this story and we’ll share a good laugh. Until then, back to the phones. “Did you know that workers’ compensation claims cost our company over $24 million last year! ?” I asked incredulously. And, with that opening line, I lost my audience. I had the best of intentions. I wanted to raise awareness. I wanted to achieve buy-in. I wanted my audience of operations vice presidents and warehouse managers to leave the meeting with a sense of purpose and a committed resolve to run their distribution centers in the safest manner possible. Unfortunately, I only achieved one of my three objectives, and that only in part: They all left the meeting. This squandered opportunity underscores an often overlooked component of successful communication: the need to tailor the message to the audience. Truth is, we did have an opportunity to reduce workers’ compensation costs. Achieving the buy-in of the operations professionals who ran the warehouses and loaded the trucks was essential to our success. And, in this instance, I failed. I joined Toastmasters to learn to organize my thoughts, tailor my presentation to the audience in the room, and deliver my message with confidence and authority. Fast-forward one year. After the debacle of the year before I had to battle to get the risk management team a spot on the operations meeting agenda. Quite frankly, I understood management’s hesitance; my presentation the year before used an hour of valuable time and achieved nothing. I told them I had learned my lesson. I joined Toastmasters to learn to organize my thoughts, tailor my presentation to the audience in the room, and deliver my message with confidence and authority. I showed them a draft of my new presentation as I told them this year would be different. And it was. I had their attention. I asked, “How many of you have had this experience in your operation at least once during the past year?” Many raised their hands. I asked them, one by one, “How was your warehouse impacted by that employee’s prolonged absence from work?” All of a sudden, a discussion broke out! Operations VP’s and warehouse managers shared how overall pick rates deteriorated and overtime costs increased. Several even talked about reduced morale and reduced bonus payouts. “If I could show you three simple things you can implement now to help avoid this disruption going forward, would you consider them?” I now had their full attention. I had a room full of risk management deputies. Mission accomplished. During that second presentation, I never talked about money. I didn’t preach the virtues of prevention as a means of reducing retained loss costs. Why? Because this audience couldn’t care less about those things. That is not the world in which they live and breathe every day. 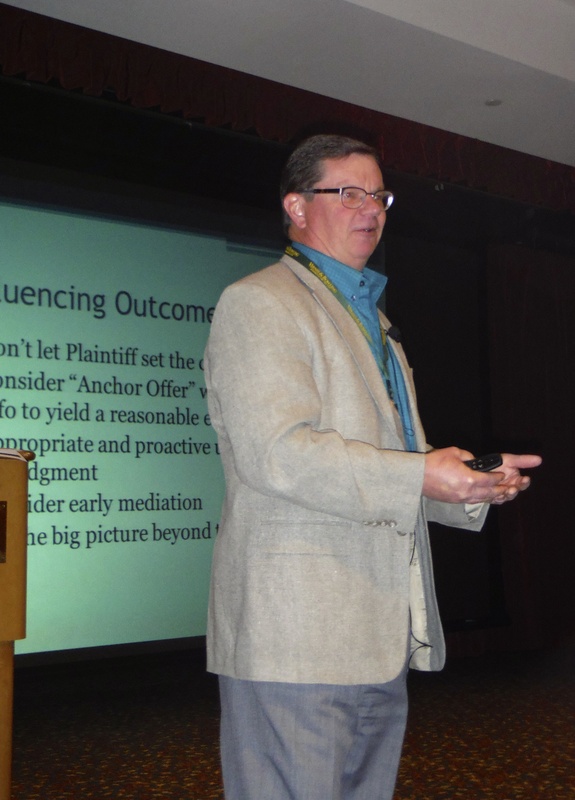 I had the honor of addressing the attorneys and paralegals of Vernis & Bowling at their 2014 firm retreat in Orlando, FL. That presentation, now some 20 years in the past, was the catalyst for some amazing results. And, for me personally, it launched a true appreciation for and enjoyment of public speaking. I offer this glimpse into my career learning process in the hopes that you might consider (or reconsider) each slide in that PowerPoint deck you’re about to present. Persuading a Board, a C-Suite, mid-management colleagues, and operations professionals to support any given objective will typically require a different approach tailored to each of those groups. To whom are you presenting? I’m sure the content is important to you, but is the content important to them? 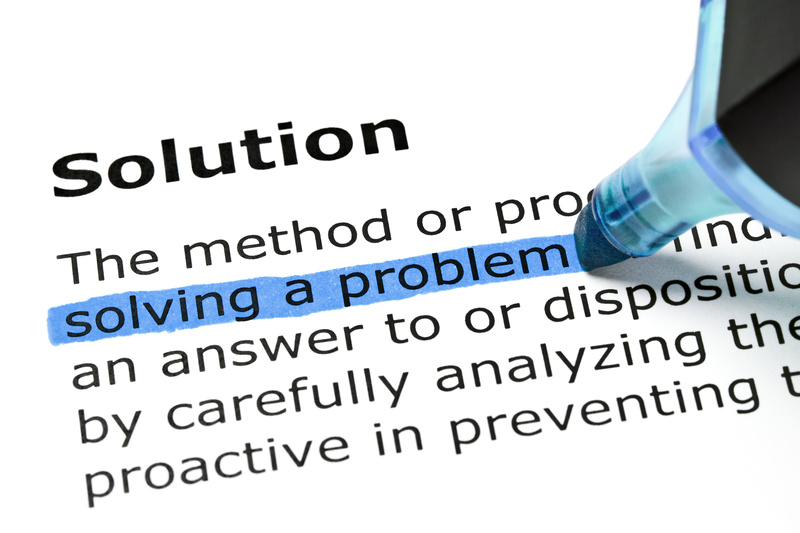 How can you make your objective meaningful to your audience? Will your supporting facts resonate with them? After several years of absence, I rejoined a local Toastmasters club two years ago. I believe strongly that well-honed communication and presentation skills are an essential component to any leader’s success. I know they have contributed hugely to mine. Click here to learn more about Toastmasters and how it can help you hone your communication and presentation skills! OK, a bit crass perhaps, but it is some of the best advice on salesmanship I’ve ever been given. Any of us who have purchased B2B goods and services have experienced this. The sales rep reaches out and you grant that first meeting. Upon entering your office, the sales rep launches into a completely one-sided dialogue about how great he is, how great his company is, and why you should be doing business with him. He asks no questions, and although you try to turn this into a real conversation, he won’t allow you to participate. He simply has too much to say! Case in point: When I was Director of Risk Management at a large restaurant chain, I was called by a representative with a local insurance brokerage firm. Upon entering my office, he asked me one question: “Do you purchase accounts receivable insurance?” he asked. “No,” said I, “our guests typically pay with credit cards…” and that was the end of the discussion. Oh, the meeting lasted another 15 minutes as the rep droned on and on about how uncollectable accounts receivable have practically sunk many businesses and how every business should have this coverage. I finally cut him off and showed him the door. As he walked out, he dropped some expensive looking accounts receivable insurance marketing materials on my desk as he said, “I’ll be in touch.” The marketing materials went straight into my trash can, and thankfully, he never did follow up. Indeed, “sales puke” is a sure-fire way to ensure that you never win that piece of business. A former boss of mine was a Covey disciple. He had his entire team read Covey’s The 7 Habits of Highly Effective People and he recited this quote incessantly. He even found budget money for each of us to attend a live presentation by Dr. Covey himself a few years before he passed away. I agree with my former boss that 7 Habits is a must read for any business professional, regardless of your line of work. But it is this quote in particular that has stuck in my mind over all these years. 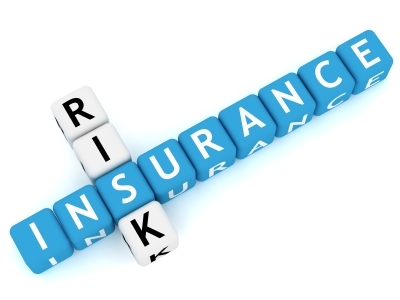 I have applied it in my risk management roles and I apply it in my current role in commercial insurance sales. 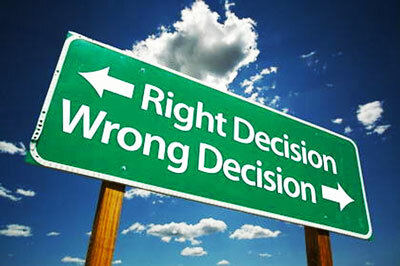 (2) You begin to see enough value in your associate’s viewpoint that you begin to change your own mind. In a sales scenario, you may learn about a pain point your prospect is experiencing and alter your approach accordingly. In both scenarios, you learn something and the ultimate end result is best for all! Do you see what is happening here? Both outcomes are wins! As I look back over my career, I readily see that I have been most successful when I have worked hard to practice good listening skills. It’s a sign of interest. It’s a demonstration of respect. And no matter the line of work, sound listening skills will open doors. Go ahead, give it a shot. I dare you. I have a couple things nagging at my brain as I enjoy lunch at my desk this afternoon. Here goes! I think telemarketers have one of the toughest jobs in existence today. Let’s face it: nobody really wants to talk with a telemarketer now, do they? Especially the ones that call in the evening, precisely at dinner time, seeking to sell that home security system or that spanking new life insurance policy. Years ago, around 1989 or thereabouts, I took a second job as a telemarketer for the Houston Ballet. Our job in the Ballet call center was to sell season tickets for the next ballet season to attendees of recent Ballet performances. They provided their contact details on information cards completed at the performance, which at least implied permission to contact them. 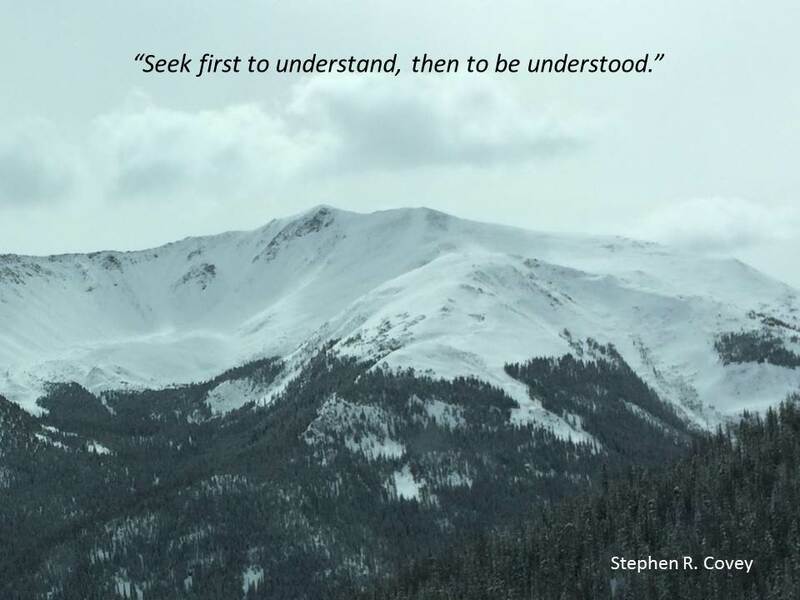 I came close to closing one sale, with the call center supervisor looking over my shoulder and whispering his encouragement, but in the end the customer had dinner on the table and it was getting cold – no sale. That was one of the most grueling nights of my working career; I went home and did not return. 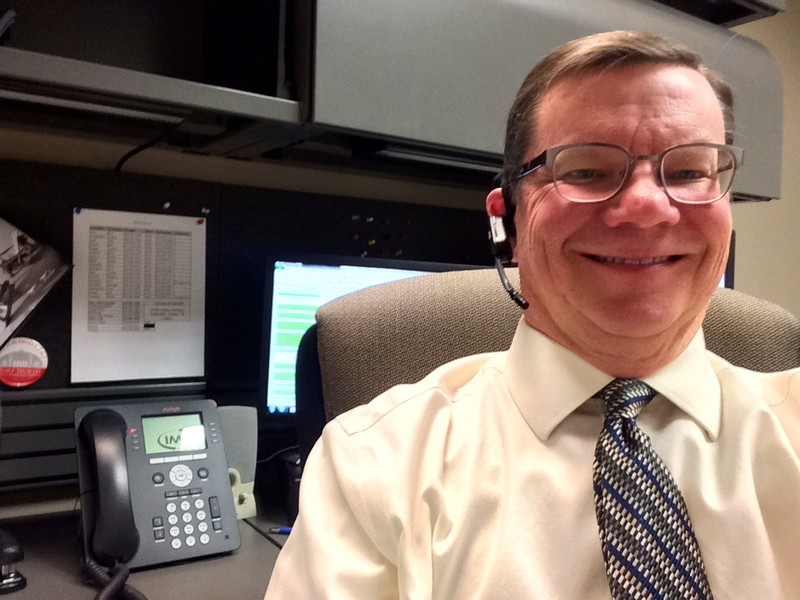 My role in commercial insurance sales today also involves telemarketing. I’m not working from a call center, but from my desk. The objective is to contact executives at prospective client companies and secure a meeting during which I can introduce my firm’s insurance and risk management capabilities in hopes of one day winning them as a client. Having recently converted from a buyer of these services to one who is now selling them, I remember what it was like to get those sales calls. Like many of the people I try to reach today, I would often let my voice mail system answer calls from numbers I did not recognize or from caller ID’s I simply didn’t want to talk to. Truth be told, my first client was won after a cold-call telephone conversation, so while I don’t necessarily enjoy the process, I do it because it’s necessary. I just wish more people would answer their phone; we are really quite good at what we do! We’ve lost some elements of good etiquette in our modern society. I’ve noticed the last few times I’ve sent invitations to an event that a large percentage of the invitees don’t bother to RSVP even though one is requested. Why is that so difficult? Somebody thinks enough of you to invite you to an event and you don’t even have the courtesy to turn them down? Worse, when they follow up to see if you are coming you don’t reply? What’s up with that? Come on, people, show some respect. 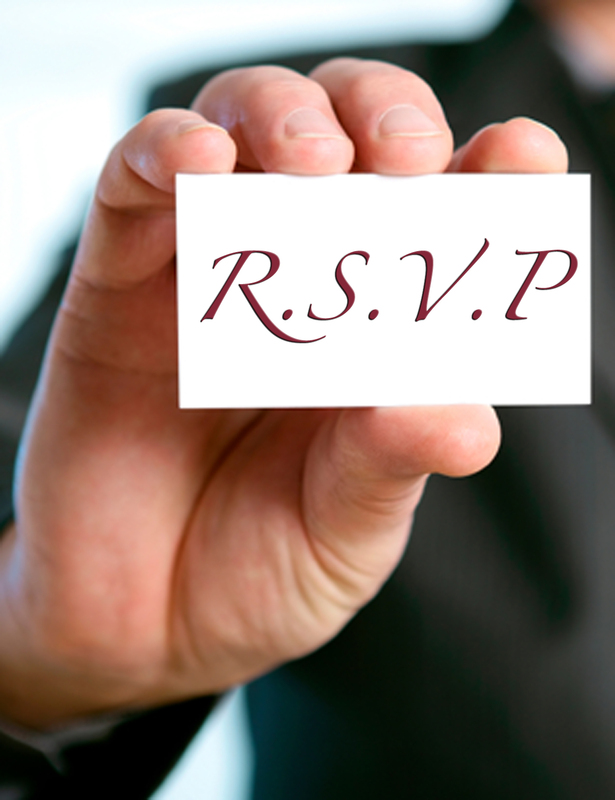 When you receive an invitation to a party, a dinner, a business function, a shower, a wedding, a child’s birthday party or whatever – please have the decency and respect to offer the host or hostess a prompt RSVP. End of rant. With that, it’s time to get back to the phones. Enjoy your Tuesday! 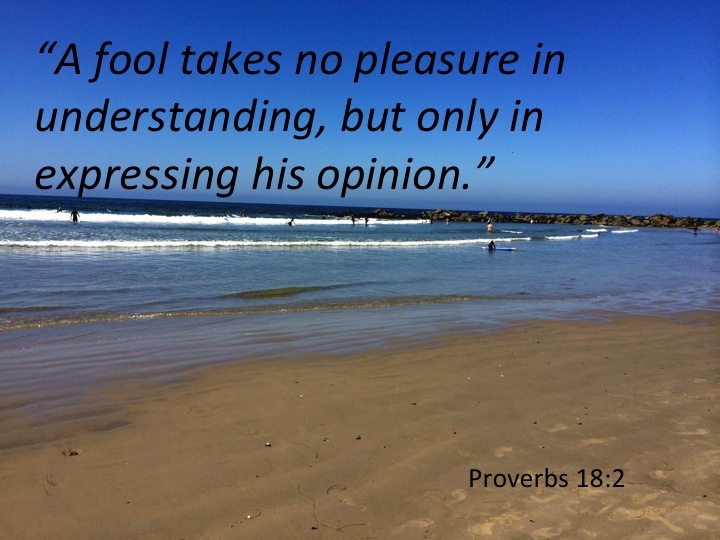 A former boss once told me, “Seek first to understand, second to be understood.” In reading my Bible this morning, I came across the Proverb below. I try to live this in all aspects of my life, sometimes more successfully than others. It’s a process.